Summary: Getting eaten by a dragon wasn't part of Ashe's plan. Not that there was much of a plan to begin with, but it had definitely involved more chasing and less running. Ashe supposes there's one good thing about all this: if he has to be trapped in a cave with a very large predator outside, at least he's with Katsu, the company medic and Ashe's current crush. Even better, Katsu has enough knowledge of dragons and medicine that he might just be able to hatch an escape plan. Even better than that, Ashe is discovering that Katsu might not dislike him after all. It's a small step, Ashe hopes, from not disliking him to something significantly more. That is, assuming they don't get eaten first. A new series! 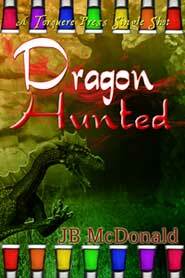 The title says it all—Dragon Hunted plops the main characters right into peril. Katsu and Ashe have been pleasant antagonists as long as they've known one another, but JB McDonald gives them a common enemy and lets them sort it out. Opposite in every way, Ashe, the willowy, irrepressible, exuberantly horny elf, is fascinated by Katsu, the human medic. Secretive and terminally but cutely grumpy, Katsu can make the faintest sign of approval into cause for celebration. The romance takes place in the action; these two haven't gotten along particularly – Ashe's methods for catching Katsu's eye usually make him look like a fool. Faced with an angry dragon, though, they manage to learn enough about each other and to work together well enough to remain uneaten. They approach almost everything from completely opposite directions, but they do eventually meet, or agree to try to meet in the middle on everything from the best way to elude the dragon to how to deal with the power that surges in them both. It's not easy: Katsu complains, "You know, just about the time I start to think maybe you're a halfway decent guy, you get all high-handed and elfity."